Readers of the Beyond Bones Blog may recognize this little guy from some of our other Fabergé blogs. This week I’ve decided that he (or she?) has been in the background too long. You wouldn’t think much of it if you saw it sitting on a corner table at your grandma’s house or in an antique shop, but Fabergé is deceptive like that. The House of Fabergé didn’t just produce Easter eggs and jewelry, they produced a wide array of accessories for their wealthy, often aristocratic clientele. There have been several cases where regular people picked up a cheesy old nick-knack from a yard sale or antique store and later discovered it was a priceless Fabergé piece. This little elephant, made of silver and sandstone with little garnet eyes is the kind of piece that often gets forgotten or overlooked, but when you know a little about it it becomes quite interesting. For example, why is it made of sandstone and not gold or jewels? The answer is so that matches can be struck against it. The elephant is actually a match holder. The idea is that someone can simply pull out a match and strike it against the elephant’s body with one quick motion. You can’t do that with gold. See? Even jewelers to the Tzars can be practical sometimes. Of course, being Fabergé, they weren’t going to go out of their way to keep things cheap, hence the legs, ears and tusks of silver and the eyes of garnet. 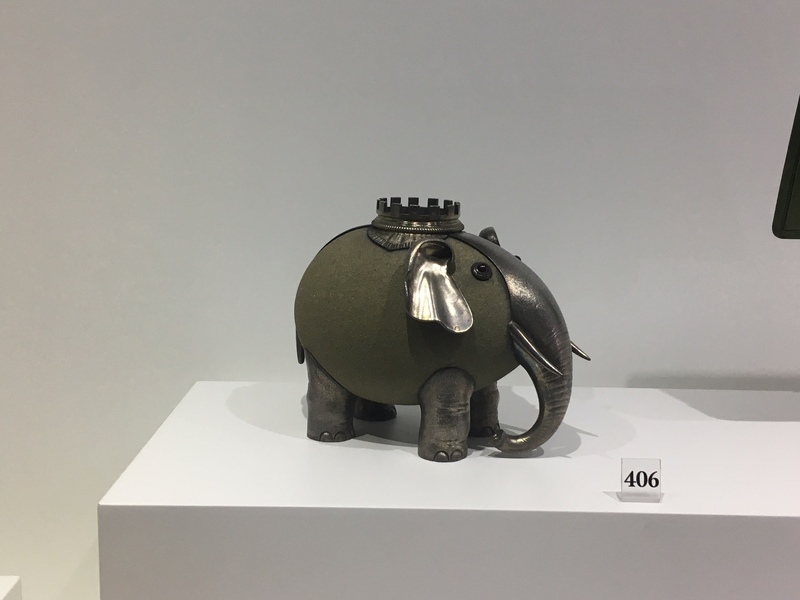 Records show this elephant match holder was purchased by Tsarina Maria Feodorovna in 1893.